This breakfast chicken hash with peppers and mushrooms is quick and easy to make and has a lovely flavor. 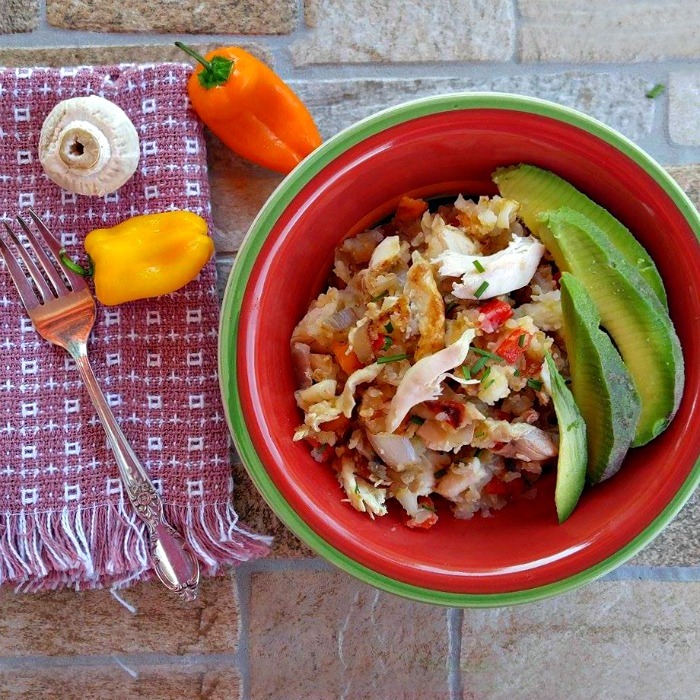 The recipe is Clean Eating, Whole30, and fits right into a Mediterranean diet. (If you substitute sweet potatoes, it is also Paleo.) It is the perfect combination of fresh flavors and hearty comfort food goodness. This recipe makes a great and fast breakfast recipe that you can serve in a bowl. Also, if you are looking for 30 minute recipes for breakfast, this one is it! Be sure to check out this list of healthy recipes if you are looking for more options for clean eating and weight loss recipes. My mother used to make a turkey hash after Thanksgiving with the leftovers. It is nice and I love it, but it’s a very simple recipe that suited my dad who wasn’t much of a veggie eater. This recipe is my variation of it using chicken and adding lots of vegetables. It is hearty and full of flavor and I often have it as a Whole30 breakfast when I am tired of eggs in the morning. Whole30 breakfast recipes normally have one thing in common: they are big on protein and very filling. See my left over Whole30 turkey hash for another filling idea. 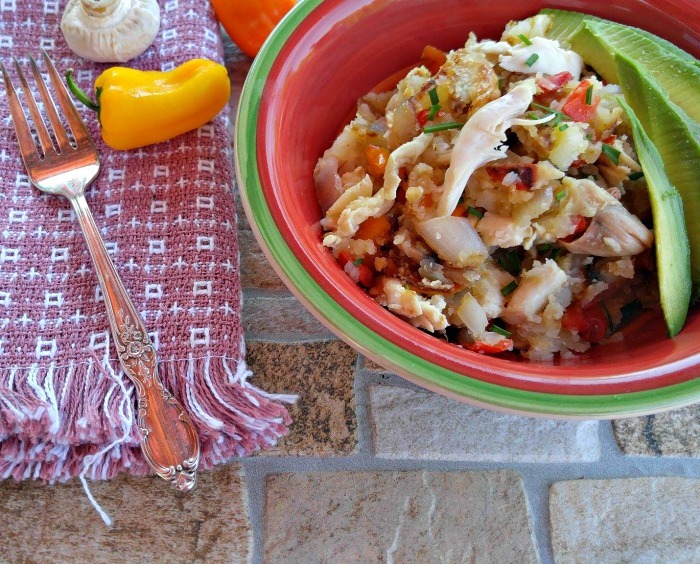 Making this Breakfast Chicken Hash is a Cinch! The recipe could not be easier to make. All that is needed for prep is to boil some potatoes and mash them and then cook everything in olive oil in a non stick skillet. If you have some left over mashed potatoes, even better. Then, it will come together in a flash. The flavors are fresh and tasty. You can use veggies in your fridge, but today, I chose red and yellow sweet peppers and fresh white mushrooms. Shallots gave me the onion flavor and my potatoes were mashed with the garlic right in them. Fresh chives added a nice garnish and bit of extra onion flavor. A few slices of avocado brought the meal all together with some healthy fats. 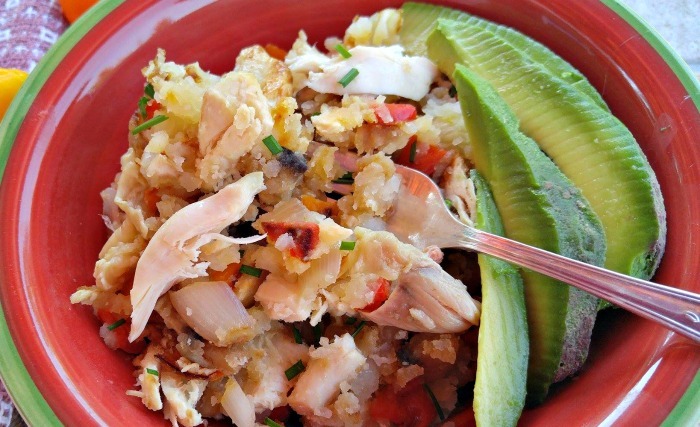 Every bite of this amazing breakfast chicken hash is bursting with flavor. It is the ultimate “comfort food” clean eating recipe. If you want something even a bit more hearty, try adding a poached egg on top and a half of a grapefruit. This gives you a bit more protein and is perfect for brunch. SUBSTITUTION TIP: What to make this recipe fit the Paleo diet? Sub out the white potatoes for sweet potatoes and you are good to go! 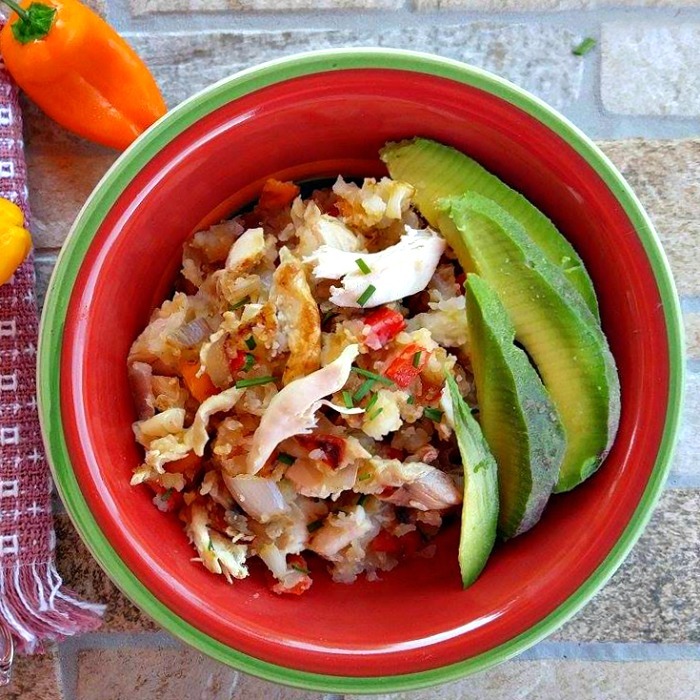 Time to think outside the box for breakfast with this chicken and avocado breakfast hash recipe. Cook the potatoes and garlic in boiling salted water until tender. Mash with the chicken broth and set aside. In a non stick skillet, heat the olive oil over medium high heat. Add the peppers, shallots and mushrooms and cook until they are tender. Stir in the cooked chicken and stir to combine. Add the mashed potatoes and cook, stirring often. I like to let it sit a bit and then use a spatula to turn it so that the potatoes brown slightly. Serve immediately with sliced avocado garnished with fresh chives. For a heartier breakfast or brunch, add a soft boiled egg on top and some fresh fruit.